Kristen Wood winds up for a pitch. Northwestern’s junior ace was overmatched against Michigan, and surrendered 4 runs in three innings of work. Going up against the third best team in the country and the Big Ten Pitcher of the Year, Northwestern managed only one hit en route to a 9-0, five-inning loss to Michigan in the semifinals of the Big Ten Tournament. The defeat marks the end of the season for the Wildcats (28-21, 14-8 Big Ten), barring a potential Women’s College World Series berth. Junior Kristen Wood, who started her second game in two days, gave up 4 runs in three innings, and afterward the Wolverines (51-6, 21-2) shelled junior reliever Amy Letourneau for five runs in just one inning. NU’s lone baserunner against Michigan ace Megan Betsa came with two outs in the second inning on a Letourneau single. Betsa struck out 10 on the day, including every NU player in the starting lineup at least once — except Letourneau. Michigan went on to win the tournament, defeating Nebraska in the championship game 6-1. While the outcome of the matchup was disappointing for NU, the season as a whole was not. The Cats advanced to the semifinals of the Big Ten Tournament for the first time since 2008, when they won the championship. Furthermore, NU may have a future star in freshman centerfielder Sabrina Rabin. The St. Charles, Illinois, native captured Big Ten Freshman of the Year honors and was named first team All-Big Ten last week. Outgoing senior Andrea Diprima will be the biggest loss for team’s offense next year. DiPrima, named second team All-Big Ten for the second straight year, launched 10 home runs this season, good for second on the team. Coming into the Big Ten Tournament, the Cats had hoped to play the role of spoiler. After earning the fourth seed and a first round bye, NU blanked Purdue (31-25, 7-14) 3-0 on Friday, defeating Boilermaker ace Lilly Fecho for the fourth time this season. Wood pitched a complete game shutout in the Cats’ tournament-opening game, striking out six and only allowing three hits. 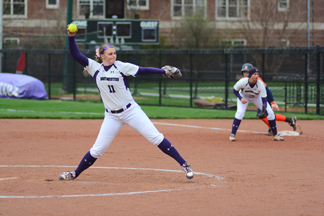 Wood said NU’s 2-run first inning pushed her to pitch her best and throw strikes. The play of the game — and perhaps the season — came in the top of the fifth with Wood struggling. After the Boilermakers loaded the bases with nobody out, Purdue’s Mary Gooding lifted a fly ball to left field, where NU senior Olivia Duehr made the easy catch. As Purdue catcher Kaylah Hampton tagged up at third, Duehr gunned the ball to the plate on one hop just in time for Cats’ freshman catcher Sammy Nettling to put on the tag. The 7-2 double play stunted Purdue’s momentum and killed the rally. NU advances to its third Women’s College World Series in four years and will face Kentucky in the South Bend Regional of the NCAA Tournament on Friday. Correction: A previous version of this article misstated the date of Northwestern’s next game. The Wildcats will play Friday, May 15. The Daily regrets the error.